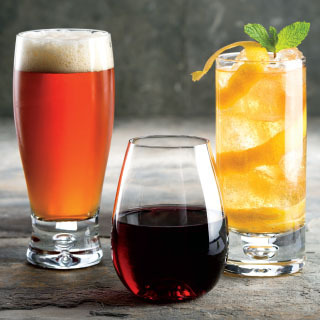 Find these, and thousands of other holiday thirst-quenching domestic, import and craft beers, spirits, mixers, wines and more at Coborn’s Liquor. When planning for your holiday entertaining, make sure to stock these wines, beers and liquors that I have selected for you. They are family pleasing favorites, sure to complement your holiday meals and celebrations. Filled with fruits like boysenberry, blackberry and dark cherry, Meiomi Pinot Noir is a light red wine that offers delicious, flavorful and silky sips. This wine pairs best with a variety of dishes especially roasted pork, salmon or pasta. This classic, complex wine boasts subtle lemon and citrus qualities. Its versatile components are a perfect match for tastes of citrus, butter, basil or toasted nuts. Riesling, a variety of wine from Germany, is a semi-sweet blend of pleasant tropical notes and crisp citrus flavors. It’s lively and well balanced with a striking finish. Pair with salads, light cheeses, desserts or spicy Asian cuisine. Grown in premium regions throughout California, this Cabernet is accented with rich flavors of roasted almonds, vanilla and hazelnuts. This wine is brooding with robust tastes that pair best with a New York strip steak or an indulgent dessert. Made from the finest corn, rye and barley malt, this bourbon has a spicy, smoky and masculine complexity. Enjoy this flavor-filled refreshment with slow cooked pork or roast beef for a variety of savory elements. As versatile as it is smooth, this timeless whiskey combines flavors of honey and citrus, peppered with sweet notes. It’s the perfect balance of sweet, spicy and nutty, with exceptional smoothness. Put the “ketel” on with this high-quality vodka filled with hints of citrus and honey that leave you with a lively tingle. Crafted using traditional techniques and the finest ingredients, this spirit is the ideal mixer for an ultimate martini, Bloody Mary, or Dutch mule. Whether you’re in the sun or hiding from the winter’s chill, this refreshing, golden beer has a universal appeal with floral orange blossom and tart flavors. Its moderately sweet and distinct spiciness pairs best with spicy dishes and Thai food. This refreshingly bold brew pours a deep gold color that has excellent Oktoberfest tastes with a clean and crisp finish. Enjoy all natural ingredients and creamy and smooth textures with a grilled steak or citrus salad. Furious is an appropriate name for this amber-colored ale that is all about those strong hops. With waves of citrus, pines, grapefruit and caramel toffee, this beer is light and crisp with a refreshingly bitter and earthy finish.